Cheers to 100 years of life, memories and significant impact! As a young artist in the 1930s, ‘40s, and ‘50s, Bransby nurtured his skills studying under renowned American artists Thomas Hart Benton and Josef Albers. He also studied under master muralists Boardman Robinson and Jean Charlot at the Broadmoor Art Academy (which became the Fine Arts Center’s Bemis School of Art) where he later taught. Bransby became an important muralist and draftsman in his own right, creating permanent works for Kansas State University, the municipal building in Liberty, Missouri, the University of Missouri, Brigham Young University, Colorado College, the Pioneers Museum, and the Air Force Academy among others. In the mid-1980s, Bransby was commissioned to restore the FAC’s facade mural originally painted by Boardman Robinson. 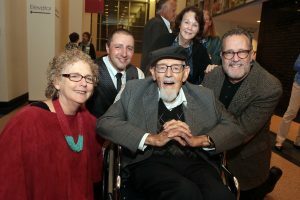 Bransby, who still lives and works in Colorado Springs, received the 2007 Pikes Peak Arts Council’s Lifetime Achievement Award. 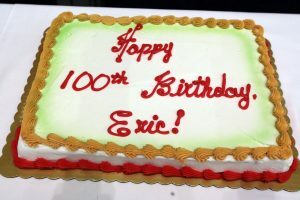 Happy 100th birthday Eric Bransby, you are a true living legend.